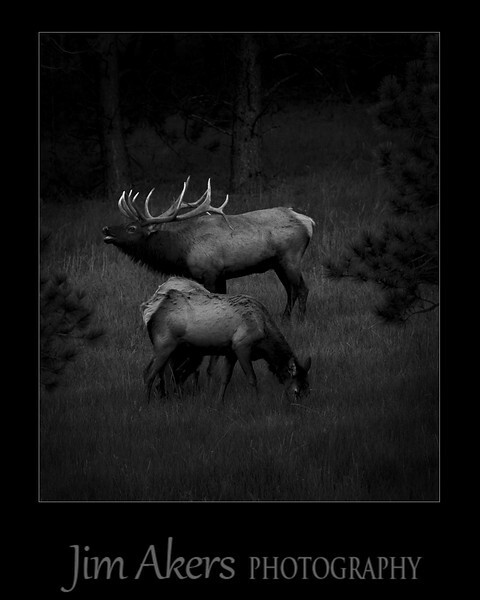 "Evening Serenade" This is a male Elk bugling with a female grazing in front of him. I took this shot in late afternoon on property of the Vermejo Park Ranch owned by Ted Turner in New Mexico. It recently received a merit of 82 from the Professional Photographers of Los Angeles County digital competition.in the Nature class. I used a Canon 500mm f4.0 lens. This is over a distance of 80 yards away if not more. I was camouflaged and somewhat hidden next to some ponderosa's on the edge of a grassy field. As long as your downwind and don't make any sudden moves your in good shape. Also, no coughing, sneezing, talking except in very low tones. Hand signals work great. I would guess that I was at around 7100 feet in altitude.